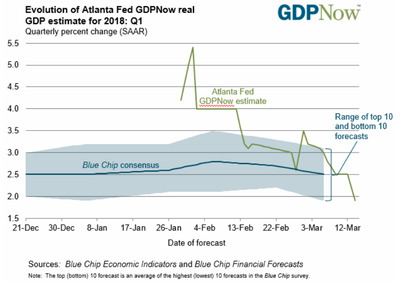 The Atlanta Fed’s GDPNow tracker projects 1.9% growth for the US economy in the first quarter. In early February, the tracker expected 5.4% growth. President Donald Trump has touted 3% growth for his administration. One model that forecasts the US economy’s performance saw another big downward revision on Wednesday. 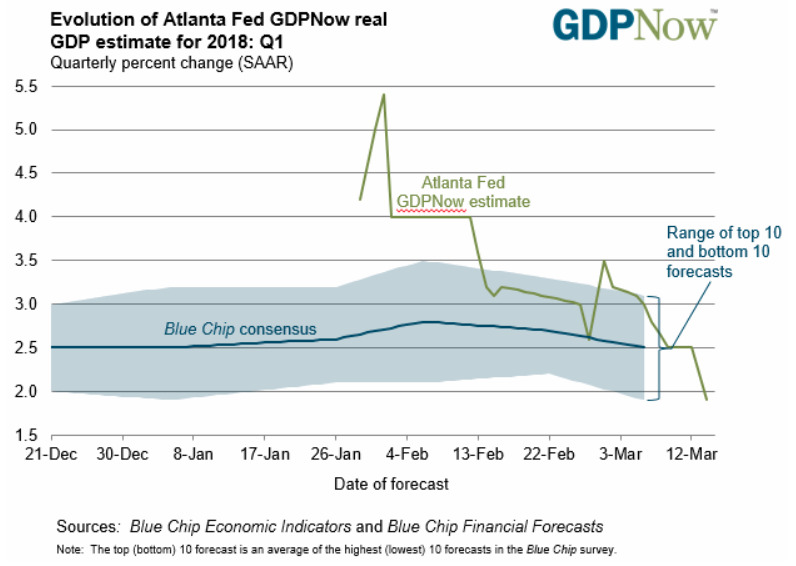 The Federal Reserve Bank of Atlanta’s GDPNow model projects that gross domestic product will increase at a 1.8% annualized rate in the first quarter. That’s down from last week’s 2.5% estimate and well below the 5.4% print from the beginning of February which was based on one month of data. A Bloomberg survey of economists shows Wall Street is anticipating 2% growth. The model was revised lower after Tuesday’s CPI report and Wednesday’s advanced retail sales reading. CPI was in line, up 2.2% year-over-year, while retail sales slid 0.1% month-over-month. “After yesterday’s Consumer Price Index release from the US Bureau of Labour Statistics and this morning’s retail sales report from the US Census Bureau, the nowcast of first-quarter real personal consumption expenditures growth fell from 2.2% to 1.4%,” the Atlanta Fed said. Wednesday’s downward revision pushes the Atlanta Fed’s estimate for first-quarter GDP growth well below the 3% target that President Donald Trump has touted for his administration. The US economy grew at a roughly 2% annual rate during President Barack Obama’s tenure. First-quarter GDP growth will be released April 27.